SUPER © Simplified Universal Player Encoder & Recorder. A GUI to FFmpeg, MEncoder, MPlayer, x264, MusePack, Monkey’s audio, Shorten audio, TAK audio, True audio, WavPack, the libavcodec library & the theora/vorbis RealProducer’s plugIn. If you need a trouble-free, yet very efficient tool to convert, encode, record or play any Multimedia file, without struggling with numerous pages of instruction manuals or wasting time in lengthy hours training, then SUPER © is all you need. SUPER © is basically a Free Audio and Video Converter, Encoder, Recorder and Player extremely user-friendly and accessible for you to acquire free of charge only with few clicks. SUPER © “The Player” surpasses any known player by supporting just any Multimedia file format. SUPER © plays files that cannot be played with WMP or even other libavcodec-based players like MPC and VLC. SUPER © “The Encoder” is the fastest and simplest tool to convert encode video with any input UNICODE filename into various output formats without time or function limitation. SUPER © “The Recorder” captures Video and Audio from the already installed device drivers on your PC and outputs them in AVI, MP4 or FLV. • Play Images (bmp, dib, fax, jpg, png, rle, tif, wmf) using Win2K/XP Microsoft Windows® resources. • SUPER © provides a variety of video codec selection with every file format conversion (encoding). • SUPER © provides a variety of audio codec selection with every file format conversion (encoding). • process while parsing internally optimized video commands for best encoding results. • simplifying the user’s encoding process while parsing internally optimized audio commands for best encoding results. • Various additional Options enhancing the rendering results. • Direct Stream Copy mode to render exact quality when the Video/Audio codecs are simply copied from the source file to the output file. • Unique Advanced H.264 profile & level selection. Not available with any other free software. • Unique Advanced MPEG-4 profile & level selection with FFmpeg. Not available with any other free software. • Unique Advanced Apple ProRes profile selection. Not available with any other free software. 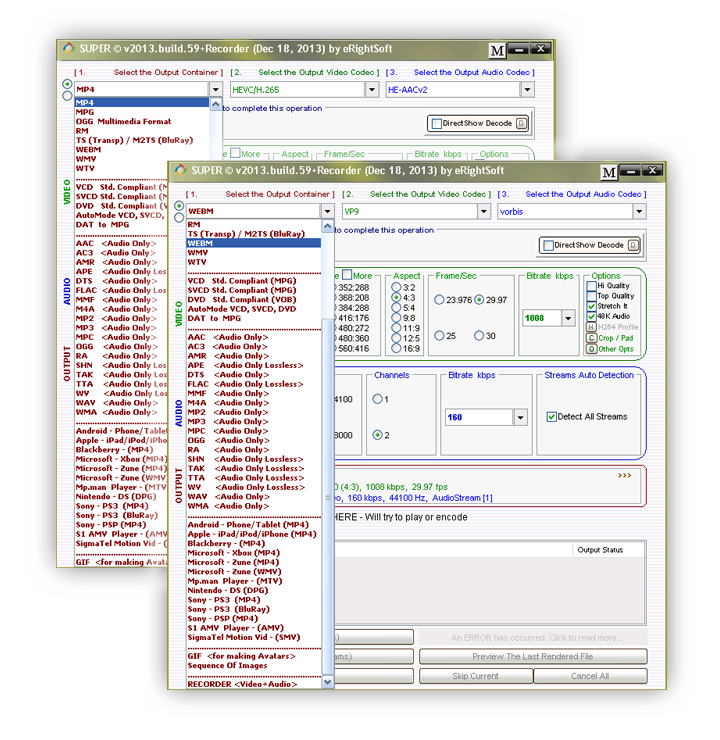 • Unique Advanced DV profile selection. Not available with any other free software. • Built-in a Multimedia File Analyzing engine (Portions by MediaInfo) to show tags and internal structure of any source file with a double click. • A simple and one click easy access fully featured menu with a right click inside the GUI or the “M” switch (upper right corner). • State of the art KOD86MIX engine to speed up the entire encoding process. • Multi-threaded encoding with auto CPU multi-core selection. • Multiple batch file processing by simple file drag and drop. The following minimum configuration is required to run SUPER © v2015.build.65+Recorder (May 31, 2015) on your PC. • SUPER © v2015.build.65+Recorder (May 31, 2015) is NOT suitable to run in a Windows emulator environment like VirtualBox, WINE or any alike. • Processor: Minimum 1800 MHz Intel® Pentium4® or equivalent. • RAM: At least 512MB installed and 176MB available. • Free Disk Space on the Hard disk where the OS is installed: 20GB or more. • Screen Resolution: 1024 x 768 or larger, otherwise the GUI will Auto-Switch to a smaller display mode. • Screen Color mode: 32,000-color video or more. • Browser: MSIE 7 or later. • Internet connection: High speed connection required during the install process to download additional components and during the normal usage of SUPER © to play and save Internet Media Streams and get update notifications.